Just a follow up to the famous rose bowl rock poster that was sent to us for an appraisal. It occurred to me that you may not have been able to appreciate this at the image size I had posted it earlier. So, here it is in all its glory! Handbills are not as valuable as a rule of thumb. But, there is a Dave Clark Five at the Melodyland Theater handbill I saw recently that was worth $1,575.00. Many nice selection of handbills, postcards, posters and much rock and roll memorabilia to peruse there, as well. Anyway, back to our American Music Show poster. 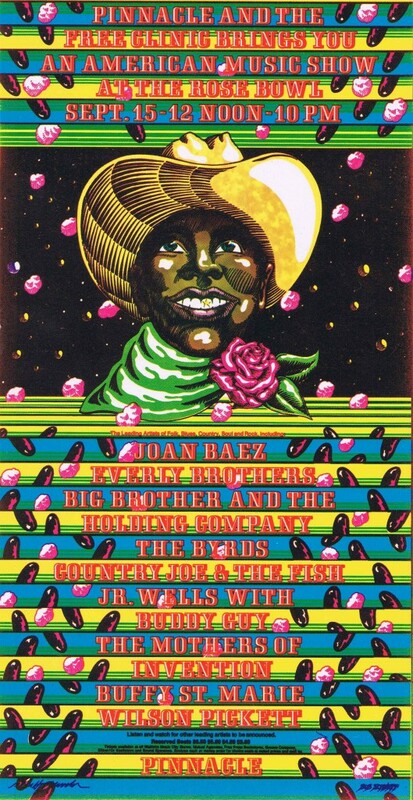 After further investigation these artists (it must have been a collaboration) John Van Hamersveld and Bob Schneph both have a body of work in the psychedelic concert poster design category and no telling what else. I will be doing even MORE R&D on these guys and this famous Rose Bowl rock poster…for I still do not have a value I can come back to the seller with. They own 30 of these from an estate sale and are willing to let them go – but for what price? More to follow for sure on our “mysterious” new psychedelic artifact. Garsh, I would really like to talk to some one who was at this famous rose bowl rock concert…it looks like a whopper. If your old enough to recognize the acts on this bill then YOU KNOW it was around 1968 when it took place.